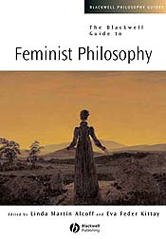 The Blackwell Guide to Feminist Philosophy is a definitive introduction to the field, consisting of newly-contributed essays that apply philosophical methods and approaches to feminist concerns. Offers a key view of the project of centering women's experience. Includes topics such as feminism and pragmatism, lesbian philosophy, feminist epistemology, and women in the history of philosophy.